Anointing Oils, Spell Oils, Conjure Oil, Ritual Oils and Essential Oils can be found in most any witch’s cupboard. Their use in magic and healing date back centuries as they play an important role when working with a particular intent. These oils are typically used in sacred ritual, ceremony, initiations and can be used to anoint almost any object. Try to stay away from “perfume” oils as these are usually made using synthetic fragrances. Synthetics are believed to contain no magic as they are not from the earth. Preferably, for magic, you want to use oils that are hand crafted with herbs, flowers, roots, pure essential oils, absolutes and charged with intent. This isn't to say perfume oils are bad, they're just not what you want for manifesting your intention. 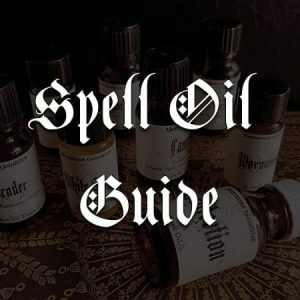 The goal is to seek out the most powerful all natural oils you can find from a reputable practitioner or witchcraft supply store you trust. If you're up to it, you can try your hand at crafting your own oils from all natural ingredients and a strong intention. In magic we are calling upon the spirits of these sacred plants to aid us in our magical workings, remembering that these are the gems of nature are also known as the “soul” of the plant. These are gifts that we have been given to help us on our quest for spiritual knowledge allowing us to tap into the magical world of universal energy. Use them wisely and with respect. Spell anointing oils can also be used to anoint the body during magical workings or worn as a perfume. When working with a specific intent its not unusual to want to carry the magic and continue manifesting your intent. Some spells and other workings take time to come to fruition, where you need to cast for a period of days, weeks or even months to manifest the final result. Do remember to always test a bit on your wrist first as pure essential oils can cause a reaction on sensitive skin. Even if they are diluted! Other objects that can be anointed are door knobs, telephones, talismans and charms, money, vehicles, the list is endless. Be creative, after all, it is your magic. Ritual Tools can also be anointed with a spell anointing oils to heighten their power and effectiveness. You may wish to anoint the corners of your altar or dab a pentagram for protection. Crystals can be anointed to charge, consecrate, cleanse or empower. It is very important to know the structure of your crystals before using oils them, as some should never come into contact with water or oil. For example Selenite, Jet and natural stones like Malachite, Azurite, should never be exposed to water or oils. Jewelry is something thats anointed by witches, pagans, wiccans, spiritualists, healers, mediums and the like. Enhance the magic contained within earth’s precious minerals by anointing your gemstone jewelry and harnessing the magical energy within. Oil Burners are a great way to allow the magical vibrations encompass your sacred space or home. Get a tealight oil burner or electric diffuser, add a few drops of your spell anointing oils or essential oils and enjoy! Looking for handmade anointing oils or spell oils? Sorcerous Sundries personally creates powerful and beautiful oils for a myriad of magical uses.